Heaven Scent. No longer bound in a stuffy sack, your devotional sweat can now effortlessly evaporate to the ether. Elevate. Use this loop (not shown) to elevate your mat to a more befitting position. Hang it on your wall and let yourself be transported. Adjust. 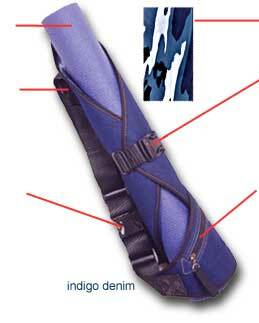 Adjustable webbing on shoulder strap and waist pocket creates a perfect fit. Discreetly placed loops keep wayward webbing in check. Inspire. Padded to protect your supple spine and lined in cotton camouflage to inspirit the warrior in you. Release. Isn't this what it's all about? The quick-release buckle holds your mat in place and gets you in your seat on time. Essential. Like a doting lover, the expandable, zippered pocket wraps snuggly around your waist and holds your essentials when, well, you don't want to. Bring your cell phone, scan card and cd player on treks through the urban jungle or carry your incense, pocket Bhagavagita and mala beads on weekend hikes to a serene clearing in the woods.